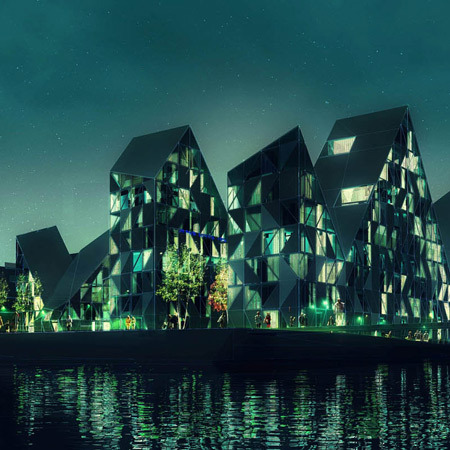 Architects Julien de Smedt and CEBRA architects in collaboration with Louis Paillard and SeArch have won a competition to build a housing complex at the Aarhus docklands development in Denmark. Called the Iceberg project, the development will create 25,000 sqm of housing and is due for completion in 2010. The development will contain 200 apartments in buildings whose jaggedy roofs resemble icebergs. JDS/JULIEN DE SMEDT ARCHITECTS and Aarhus- based CEBRA, in collaboration with the Dutch firm SeArch and French architect Louis Paillard wins the competition to build a 25,000 sqm housing complex in the new Aarhus Docklands development. The project will be developed by the Tækker Group and Brabrand Boligforening with an expected completion date of spring 2010. The Aarhus Harbour development provides a huge opportunity for Denmark’s second largest city to develop in a socially sustainable way by renovating its old, out-of-use container terminal. The area is meant to become a living city quarter, comprised of a multitude of cultural and social activities, a generous amount of workplaces, and of course, a highly mixed and diverse array of housing types. The project’s main obstacle is the density set up for the development, the desired square meters are in conflict with the specified site height restrictions and the overall intentions of providing ocean views along with good daylight conditions. The Iceberg negotiates this problematic, by remaining far below the maximum heights at points and emerging above the dotted line at other moments. “Peaks” and “canyons” form; eliciting the project’s iconic strength while ensuring that all flats will be supplied with a generous amount of natural lighting and waterfront views. “Århus will get a fantastic harbour front with unique architectural buildings that both in appearance and functionality prove that we are a city of grand ambitions. Our desire for this area goes beyond just a façade without life and purpose. We want a living city where everybody thrives. Both those who live and those who work in this “City near the harbour / De Bynære Havnearealer”. Projects of this calibre are a big step towards this goal.” -Mayor, Nicolai Wammen.